Kate from Thyme for Cooking is hosting this edition of Weekend Herb Blogging. Perhaps using Thyme would have been more appropriate but being a bit of a dill I went for Dill. 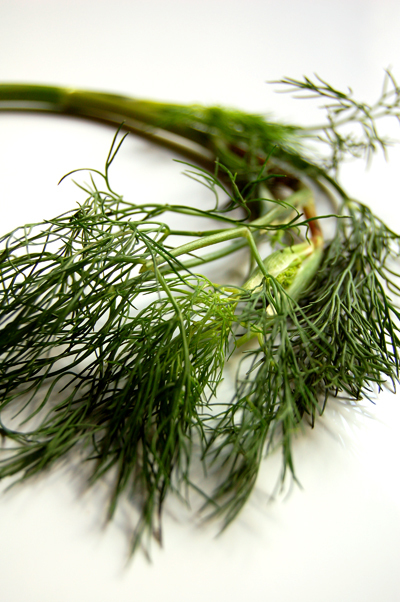 Dill is an annual herb known for it's delicate, feathery leaves and it's sweet yet mild aniseed flavour. In Saxon times, dill water was used to soothe babies and it's still used today to help babies suffering with colic. For the Romans and Greeks it was considered a sign of wealth and also proved popular due to it's perceived healing properties. Today, these healing properties can be traced to two components - Monoterpenes and Flavonoids which help to remove damaging free radicals and carcinogens from our system. The volatile oils in Dill also have anti-bacterial properties. Nutritionally Dill contains Calcium, Copper, Iron, Magnesium, Manganese, Phosphorus, Selenium and Zinc as well as Vitamins A, BI, B2, B3, B6 and C.
This week I'm opting for another George Calombaris recipe from the March issue of Australian Gourmet Traveller - you might remember a few weeks ago for WHB#73 that I made his Saganaki Martini. Like the martini, this is also a dish we've eaten at his restaurant where it partnered the most amazing deep fried Quail we had ever tasted. 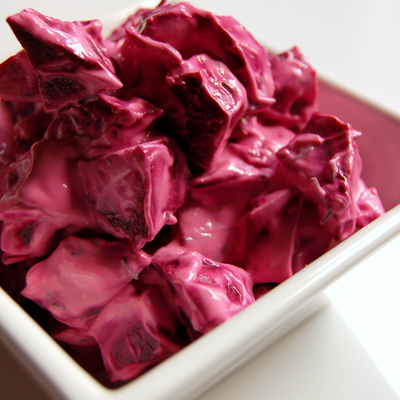 The dish I'm making is Beetroot Tzatziki - roasted beetroots combine with thick Greek yoghurt that has been flavoured with orange and lemon rinds, shallots, garlic and dill. The combination is fragrant with the sweetness of the beetroots heightened by the citrus rinds. The colour, inspiring, the taste divine - this is tzatziki as you've not had it before. Place the beets/beetroot into a baking dish and drizzle over with olive oil and season with freshly ground salt. Give them a bit of a stir to ensure they are well coated before placing in the oven to cook for about 1 hour or until tender. Naturally enough the time needed will depend on the size of the beetroot used - try to choose beetroot of the same size. Let them cool slightly before peeling and dicing them into small cubes. Put the drained yoghurt into a bowl along with the orange and lemon rinds, shallots, garlic and dill - stir well before adding the beetroot cubes. Season with freshly ground salt and black pepper to taste. A perfect companion to a variety of meats or enjoy it as a chunky dip served on roughly torn shards of warmed pita bread. I have some beetroot going spare in the fridge and some dill in the herb drawer...this would be great with fish! I adore the colour! Looks delicious. I don't cook with Dill at all, I never think of it! Thanks Katie - I do hope you enjoy this! Thanks Freya and Paul - excellent idea to partner with fish. Thanks Sara - it is one of those herbs that you don't seem to use as often as others. I've been spreading the good word this afternoon. I had lunch with some London food bloggers and showed them a few of my favourite blogs, including yours of course. They were well impressed. Quite right too. 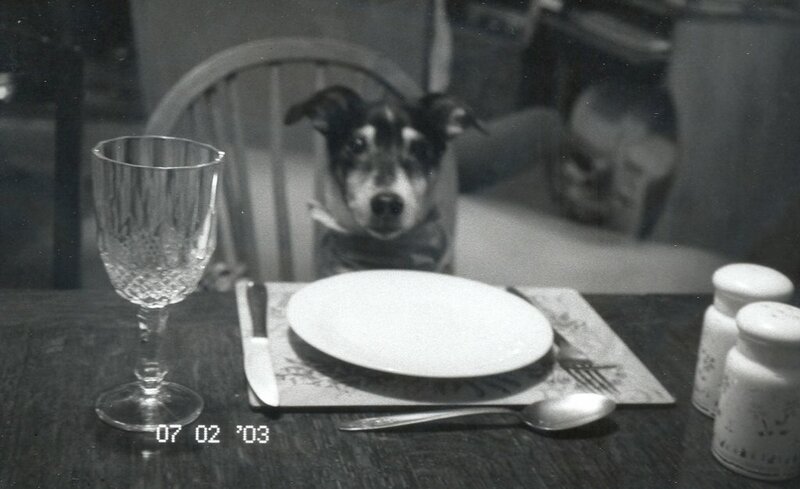 Thanks Trig - that really is so kind of you to do that and a welcome to your food blogging buddies! 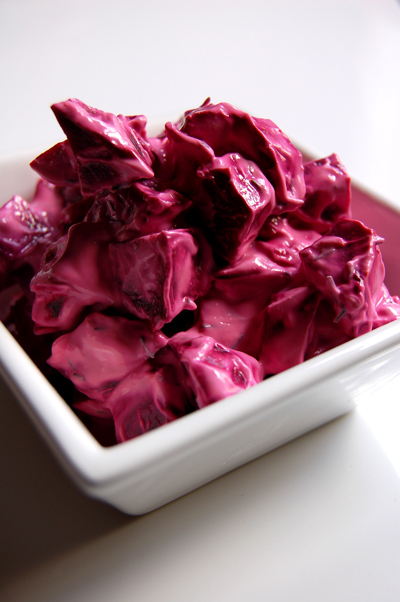 Two of my favourite vegetable based foods - tzatziki and beetroot. I'd have never thought up the combination of them but it looks fabulous. Like, Trig said, you now have a new influx of readersthrough him spreading the word. This includes me and I'm very glad he sent me here. This combination of flavours sounds really good. I usually pair beetroot with sour cream and dill and I can see how the light and tangy greek yoghurt with citrus would give the beetroot a real lift. It's such a beautiful colour too. Lovely photo of the fresh dill. I see that Katie has given you the award for the prettiest entry for WHB, which is just fine with me. Another very interesting entry! Thanks Helene - I hope you enjoy this dish! 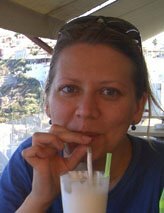 Welcome Ros and many thanks go to Trig for being so supportive of this blog. I do think it's the citrus that just gives it that extra bit. I do hope you continue to visit! I've made something very similar - beetroot is one of my favourite vegetables. Like your picture!! I just made this, with a couple of variations, and it is amazing! I couldn't find Greek yogurt, so used Astro Balkan-style yogurt, and it worked fine. It takes about an hour to drain, so set it to drain before you pop the beets in. I also used the juice from the lemon, as I like things extra lemony. Instead of dicing the beets after they were roasted, I put them and all the rest of the ingredients except the dill into a food processor and pulsed it until it was blended, but still chunky. I am serving this tonight for guests, and I think it will be a hit! Sounds delish Dewey - I hope it's a hit tonight! Melbourne Food and Wine Festival Begins!